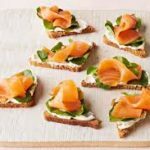 Place a small piece of salmon on each melba toast. Place a small dab of either sour cream or cream cheese on top and then sprinkle a few pieces of the chopped chives. You can also do this on cocktail bread or mini bagels.